The Mystics have opened training camp with a revamped roster and elevated expectations. Five reasons to watch the San Antonio Stars this season. The Lynx opened training camp hungry for another title and ready to move past last year’s Finals loss. Coach Jenny Boucek was pleased with the Storm’s first day of camp. 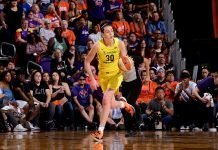 Breanna Stewart embraces the power of the platform that comes with a WNBA spot. Don’t call Skylar Diggins a female athlete. China’s Shao Ting getting acclimated to Lynx and hoping to make roster. Samantha Prahalis is “95 percent sure” she’s retiring. Lynx coach Cheryl Reeve says the WNBA’s popularity is about society changing its views on women. BRAVO. The Carolina Stars will fill a pro women’s void in the state. The South Carolina Gamecocks will be recognized at the State House tomorrow. After losing Destiny Slocum, Maryland has landed a four-star point guard recruit. Ohio State’s early season schedule includes Stanford and Connecticut. Former Irish woman Ali Patberg has transferred to Indiana. Lisa Leslie has high hopes for South Carolina coach Dawn Staley. Longtime DePaul assistant coach Bart Brooks is the new head coach at Belmont. Kevin Baker is UTEP’s new head coach. USA Basketball has put their team selection committees in for 2017-2020, and the list is loaded. Tamika Catchings has been named to the USA Basketball development committee.